Nevertheless, PolitiFact persevered and came up with a worthy recipient. Donald Trump’s near inability to ever say anything truthful was bound to score a victory one way or another. The rest of the political liars stood little chance against someone who is certifiably pathological. The Washington Post has documented more than 1,600 lies told by this record-breaking prevaricator. “A mountain of evidence points to a single fact: Russia meddled in the U.S. presidential election of 2016. Achieving this “honor” may be consolation to Trump after not being chosen as Time Magazines’s Person of the Year. PolitiFact noted that virtually every assessment of Russia’s activities concluded that Vladimir Putin and Company did interfere with the U.S. election in a multitude of ways. It was not a partisan observation. Republicans and Democrats alike recognized that Russia was deeply involved in election hacking and propaganda. And as PolitiFact put it, “After all this, one man keeps saying it didn’t even happen.” Indeed, Trump stood alone in denying the obvious and defending his pals in the Kremlin. “This Russia thing with Trump and Russia is a made-up story,” Trump told NBC’s Lester Holt. “It’s an excuse by the Democrats for having lost an election that they should’ve won.” And he tried desperately to shift the blame elsewhere, including to Hillary Clinton, Barack Obama, China, or some fat guy in a New Jersey basement. Anyone but Vlad. In fact, Trump explicitly let Putin off the hook because the Russian dictator assured him that he didn’t do it. And Trump believes Putin over his own American intelligence agencies. PolitiFact spent little time addressing whether or not Trump colluded with Russia to impact the outcome of the election. But it’s hard to separate the two. Especially when every utterance by Trump supports the Russian version events. What’s more, Trump and his associates repeatedly denied any encounters with Russians during the campaign and after. However, they later had to admit that many of them had many meetings that they all somehow forgot for some reason. There can’t be that many blatant misstatements by that many people without there being some intent to hide something. He is still calling the Russia investigations fake news. And despite the indictments (and two guilty pleas) of four of his accomplices (so far), he stubbornly asserts that the investigations are a waste of time and money. Then he shifts from that to his desperate denials of sexual misconduct and crimes. This may be his first bid for 2018 Lie of the Year. And he’s off to great start by claiming that he doesn’t know, or never met, any of his victims. The only problem with that is that one of his accusers was a contestant on The Apprentice. Another participated in his beauty pageant. And another was placed at the scene of his abuse by his own witness. PolitiFact may have to exempt Trump from any future recognition in this competition. No one else can possibly challenge such an accomplished liar and skilled reality distortion machine. 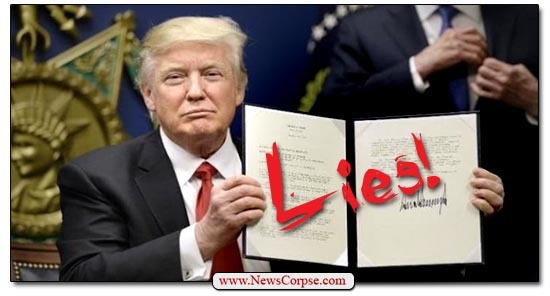 Perhaps they should rename the whole affair “The Donald Trump Lie of the Year Awards” and let some other sham merchants have a chance to win. Traitor trump lives in an alternate universe. I really do hope that he will return there quickly and permanently. To say Trump believes this or that is nonsense. He knows what he is saying is a lie. He is just a criminal. The sooner he is tried and convicted the better. I believe the biggest lie Drumpf told this year was denying it was his voice on the Billy Bush tape. The investigation is still ongoing about Russian interference in the 2016 election, even though we know it’s true. As for the tape, Drumpf originally tried to pass it off as locker room talk but then he denied it was even his voice. Billy Bush and 7 others were witnesses so we know it was him. That’s a proven lie. Why just one? I’d have gone with “All of them Katie!” on Trump’s lies for “Lie of the Year 2017”. If they had a 1st to 100th place on lies Trump would take all 100 places-easily! Call him names, he deserves all of them, but never Forget we have to hold all ‘Family Values Republicans” responsible for him. Don’t get jaded, get motivated to vote! If you support those “FVRs” by ignoring the danger of ignoring them, things will change beyond the damage so far. Drive your friends to the voting sites, help re-register the ones removed by the FVRs with their restrictions, and be sure to vote with the understanding your children deserve better. That’s my 2 cents.